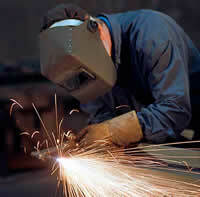 Make your fabrication shop more productive and efficient with E2 Manufacturing software. As with all job shops, customers are constantly changing due dates, quantities and everything in between. Some fab shops have simple bills of material while others get into multi-level complicated assemblies. E2 manufacturing scheduling software has built in sheet calculators to help you figure out how many parts you can get out of a sheet of material. For the one of a kind job that you’ll never see again, the E2 manufacturing inventory software estimating can help you look back at similar jobs to help you quote more accurately. E2 manufacturing process software can also link the material to a specific routing step so you won’t order the material or make the component part until you need to. You can even do a “quickie quote” with manufacturing process software without all of the estimating detail. The “quickie quote” allows you to put in all of the detailed routing information and material after you get the job. The E2 job shop software order entry handles all of your release schedules, split deliveries, complex assemblies, split jobs, changing due dates and much more. Fabrication shop software allows you to see exactly what inventory you have on hand and create the job all in one step. It will even explode the BOM to create component jobs that need to be manufactured for the customer assembly. The powerful, yet flexible scheduling whiteboard allows you to schedule the shop floor realistically. You can set your lasers up as finite, press brakes as infinite and welders based upon how many employees show up that day. Purchase material directly for the job. No need to keep expensive raw material out on the floor until you’re ready to use it. Ship the job out on time every time. E2 works with your UPS world ship so your customers can track their parts until they hit their dock! E2 prints all kinds of shipping labels, certificates of conformance and bills of lading to save you time.